Fortunately, a clever developer has built a Firefox extension to solve this problem. JSONView renders a plain-text representation of the JSON object, complete with indentation and color-coding whenever you access a URL that outputs JSON data. 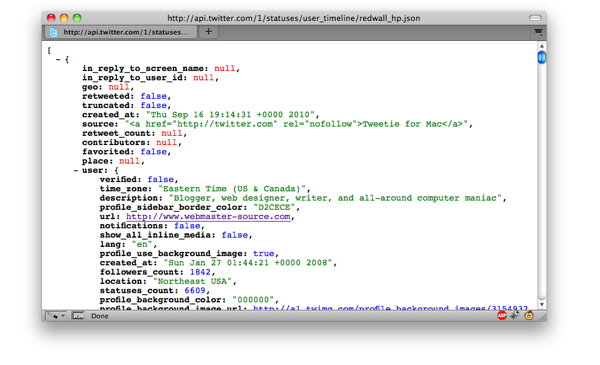 For example, the Twitter API. If you click this link in Firefox, you will be prompted to download the file. With JSONView installed, you would see output from the following image. This plugin was created for The Museum of Modern Art, whose weblog Inside/Out appears within an existing structure built with Ruby on Rails. Instead of reimplementing the site templates as a WordPress theme, we opted for a Rails front-end that displays content served from a WordPress back-end. JSON API provides the necessary interface for retrieving content and accepting comment submissions. I like Chris Coyier’s suggestion of using it in conjunction with the jQuery UI Autocomplete component in order to add a Google Suggest-type feature to your search form. BuySellAds and Google Analytics, in an attempt to make the internet faster, recently changed the code snippets they use for serving ads and tracking visitors, respectively, to be non-blocking and asynchronous. This means that the scripts won’t hold up the rendering of your pages while they load. If you reload this page, as an example, the ads to the right may actually appear after the rest of the page has finished loading. It gives the appearance of being a lot faster. There’s a really neat post over at Tutorialzine on how to build A Twitter List Powered Fan Page. It’s a little widget, that would go in your sidebar or some similar place, where it would display the Twitter avatars of anyone who wanted to click a button to add themselves to a Twitter List (along with an overall count of the “fans”). GetGravatar is a jQuery plugin that is a perfect touch for blog comment forms. It monitors an email address form input, and makes an AJAX request to load a Gravatar. (See a demo.) This would enable you to show a user’s Gravatar next to the comment form immediately after they input their email. Obviously there are more creative uses for this, but either way it’s a nifty script. If a user visits several sites that reference jQuery (or another library) from Google, their browser caches the file and will only load it once, reusing the cached file on the other sites when they are loaded. This is because you’re referencing a file from ajax.googleapis.com instead of your own domain, and if multiple sites reference it, the browser remembers it already downloaded the file and uses the local copy. FaceBox, is yet another way of implementing this functionality, but styled in a similar manner to FaceBook’s pop-up boxes. I recently stumbled across AJAX Whois, which may have become my new favorite way to find domains and check WhoIs info. It’s fast, and it’s easy to use. I’m serious when I say AJAX Whois is fast. Start typing in the form, and the web app searches as you type. By the time you’ve finished typing in a domain, the results are already there. There are a couple of small features that really make the site easier to use. Number one is the favorites feature. If you find a domain that you want to remember while you’re searching other ones, you can just click the favorite button and it will be added to a space in the sidebar for easy access. The other feature is even simpler, yet you would really miss it if it wasn’t there; You don’t have to enter a TLD when searching. Many whois services require that you enter a TLD, even if you want to see results for multiple TLDs. Luckily AJAX Whois doesn’t follow that trend. When Should You Use AJAX? AJAX is being used in more and more places, often when it doesn’t need to be…and when it shouldn’t. With all the talk about how you can use AJAX for everything, the real question is when should you. You should use AJAX in places where it will improve the user experience. One example is with polls. Why should a full pageload be required just to vote in a poll (or view the results)? That’s a waste of your users’ time, and a waste of your server resources. Basically, you want to use AJAX for things where an extra pageload would be irritate the heck out of everyone. Suppose you have a star-rating system, like on Netflix. Wouldn’t it be horrible if you had to sit through a page refresh every time you rated a movie? Use your own judgment.